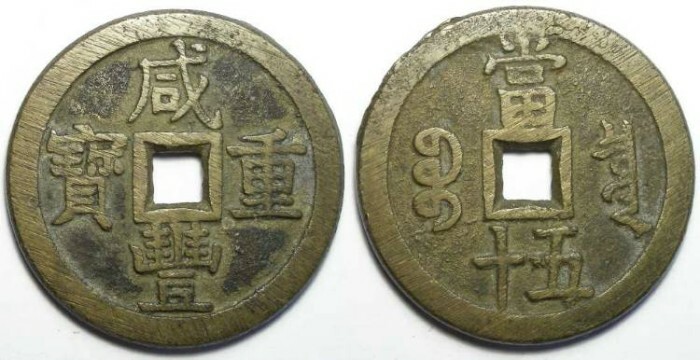 Hsien-Feng ruled during the time of the Tai Ping rebellion, and the large denomination inflationary coins and paper money he issued resulted from that war. Emperor : Wen Tsung using the title Hsien-Feng. Date : 1851 to 1861. Denomination : Bronze 50 cash. Mint : Board of Revenue, south branch. Size : 55.3 mm. Weight : 63.85 grams. Grade : gVF, with clear heavy orginal file marks (as a high grade specimen should have). Reverse : "T'ang wu-shih boo ciowan" (value 50, Board of Revenue mint).